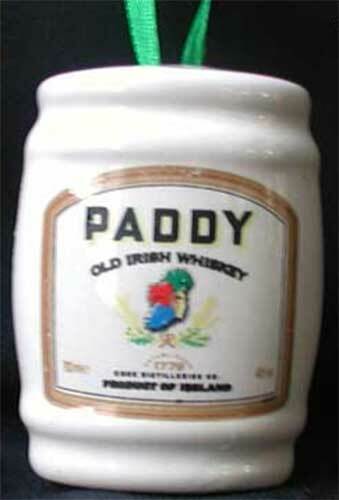 Paddy Whiskey is a brand of 80-proof blended Irish whiskey produced in Cork, Ireland, by the company Irish Distillers. It is Ireland's third best-selling whiskey. This Irish whiskey ornament features Paddy branding on a white porcelain barrel. The Paddy Whiskey ornament is a dimensional and double sided design that measures 2" wide x 2 3/4" tall x 1 1/2" deep. The Irish whiskey barrel ornament is ready to hang on your Christmas tree with the included green ribbon; it is gift boxed, complements of The Irish Gift House. The Paddy ornament is made in Ireland by Liffey Artefacts. This shot glass features the Paddy Irish Whiskey logo.